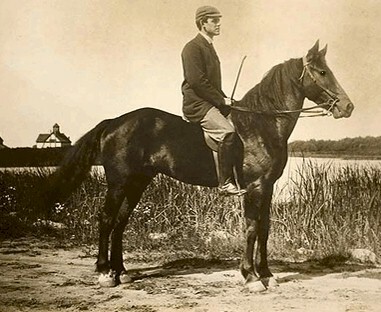 Narragansett Pacers were the first horse breed developed in the United States, but is now extinct. This breed was developed in the United States during the 18th century and associated closely with the state of Rhode Island, and it had become extinct during the late 19th century. The Pacer was developed from a mix of English and Spanish breeds, although the exact breeds are unknown, and they were known to and owned by many famous personages of the day, including George Washington. Sales to the Caribbean and cross-breeding diminished the breed to the point of extinction, and the last known Pacer died around 1880. Narragansett horses possibly could have been an ambling horse, rather than a true pacing breed. The pacer was known as a sure-footed, dependable breed, although not too flashy or always good-looking. Pacers were used for racing and general riding. They were frequently crossed with other breeds, and provided the foundation for several other American breeds, including the American Saddlebred, the Standardbred and the Tennessee Walking Horse.